Often called the “sneak thief of sight,” glaucoma refers to a group of eye diseases that damage the nerves carrying images from the eye to the brain. Primary open angle glaucoma (POAG) is a leading cause of blindness in the United States, according to the National Eye Institute. A study published in the journal Archives of Ophthalmology estimates that 2.2 million Americans have the disease, but half don’t know it. Glaucoma usually produces no symptoms until the disease has progressed to the point of damaging a person’s sight. Although glaucoma has no cure, it can be controlled and vision can be maintained if it is detected early. That’s why comprehensive eye examinations are recommended at least every two years after age 35 for those at increased risk for the disease. Although anyone can get glaucoma, the risk is higher for those over age 60, those who have a family history of the condition and African Americans. Older Hispanics/Latinos are also at elevated risk, the highest prevalence being among those of Mexican descent. Another risk factor for glaucoma is high pressure within the eye. Pressure in the eye is known as intraocular pressure. However, it is a common misconception that having high intraocular pressure means you have glaucoma. In fact, you can have high intraocular pressure, known as ocular hypertension, and not have glaucoma. Whether you develop glaucoma depends on how much pressure your optic nerve—the bundle of 1.2 million nerve fibers that transmits images from the eye to the brain—can take without being damaged. The first step in understanding glaucoma and its relationship to intraocular pressure is learning how the eye works. The outer protective layer of eye includes clear tissue through which light enters, known as the cornea. The iris is the colored part of the eye containing muscles that make the pupil open and close. The pupil is the black area in the center of the eye where light enters. Located inside the eye, behind the iris, is the lens. The lens is a transparent structure with an outward curve on both sides that focuses light onto the retina at the back of the eye. The retina is made of light-sensitive tissue that sends visual messages via nerve impulses to the brain through the optic nerve. The brain then processes the optic nerve’s signals into the images that you see. The anterior chamber is a space in the eye bordered by the cornea, iris, pupil and lens. Flowing through this chamber is a liquid, called the aqueous humor, which supplies oxygen and nutrients to the cornea and lens and helps maintain the shape of the eyeball. A tiny gland, called the ciliary body, is located behind the iris and produces the fluid. The fluid travels from the gland through the pupil into the anterior chamber, exiting at an angle where the cornea and the iris meet. At the angle is a spongy mesh of tissue that works like a drain, called the trabecular meshwork. Open-angle. In this most common form of glaucoma, the angle where the cornea and the iris meet is open, but the aqueous humor fluid passes too slowly through the meshwork drain. As a result, the pressure in the eye gradually increases. This compresses cells in the optic nerve. If left untreated, the compression eventually kills the optic nerve cells, causing blindness.Early detection is essential to managing open-angle glaucoma and minimizing vision loss. Treatments include medications in the form of eyedrops and pills to reduce the amount of fluid (aqueous humor) in the eye or improve its drainage. Both treatments help reduce intraocular pressure. Surgery, by laser or conventional means, also may be recommended. Normal-tension. Some people with normal eye pressure develop glaucoma, a disease known as low-tension or normal-tension glaucoma (NTG). In this form of the disease, eye pressures are within the normal range, but the optic nerve progressively deteriorates. The progression of the disease is faster in those who have the specific risk factors for progression, namely, Japanese ancestry,cardiovascular disease, family history of any kind of glaucoma and being female. Research is continuing on this form of glaucoma, which is thought to be related to poor blood flow to the optic nerve. Pigment dispersion syndrome affects young myopic individuals. Glaucoma occurs when grains of pigment from the back of the iris flake off into the aqueous humor, eventually clogging the drainage meshwork and raising eye pressure. The syndrome produces no noticeable symptoms but can be detected and monitored in routine eye examinations. According to the American Academy of Ophthalmology, about 30 percent of people with pigment dispersion syndrome develop pigmentary glaucoma, a type of open-angle glaucoma. In this type of glaucoma, exercising can cause a pigment shower and cause blurry vision from the increased intraocular pressure. People with angle-closure glaucoma tend to have a smaller-than-average anterior chamber, and the angle between the iris and the cornea where the aqueous humor drains is also smaller. When the lens naturally grows larger with advancing age, the aqueous humor has difficulty flowing in the tight space, causing the fluid to build up behind the iris, narrowing the angle even more. When the pupil dilates, such as when entering a dark room, or when experiencing anxiety or stress, taking certain over the counter medications or medications with the glaucoma warning label, the angle can narrower even further, and the iris is forced against the trabecular meshwork, stopping drainage. Without drainage, pressure in the eye squeezes and damages the optic nerve. In acute angle-closure glaucoma, intraocular pressure rises suddenly, producing pain. The eye turns red, the cornea swells and clouds, vision may be blurred and lights may appear as if they have halos. Acute angle-closure glaucoma is a medical emergency. To treat it, health care professionals may initially administer medications to reduce eye pressure as fast as possible until a surgery callediridotomy can be done. Iridotomy is a procedure that uses a laser to make a tiny hole in the iris to improve the flow of the aqueous humor. In chronic angle-closure glaucoma, the iris gradually closes over the drain, causing no recognizable symptoms. As this occurs, scars form between the iris and the drain, eventually blocking it and driving up intraocular pressure. Treatment may include eyedrops and surgery. Pseudoexfoliation glaucoma occurs when a whitish material, often found on all surfaces of the eye, causes clogging of the eye’s drainage meshwork and increases the intraocular pressure. While pseudoexfoliation glaucoma causes no noticeable symptoms, it can be detected through a routine exam. Many individuals with pseudoexfoliation glaucoma are of European descent. Over time, the initially open angle may narrow and close as the lens in the eye increases in size with age. It can lead to angle closure glaucoma. This type of glaucoma is secondary; the whitish pseudoexfoliation material causes the problem. Visual acuity. This test measures the ability of your central vision to distinguish details and shapes. You will be asked to cover an eye and read a chart to measure how well you see at various distances. Tonometry. This is a test to measure your intraocular pressure. It can be performed in a variety of ways. 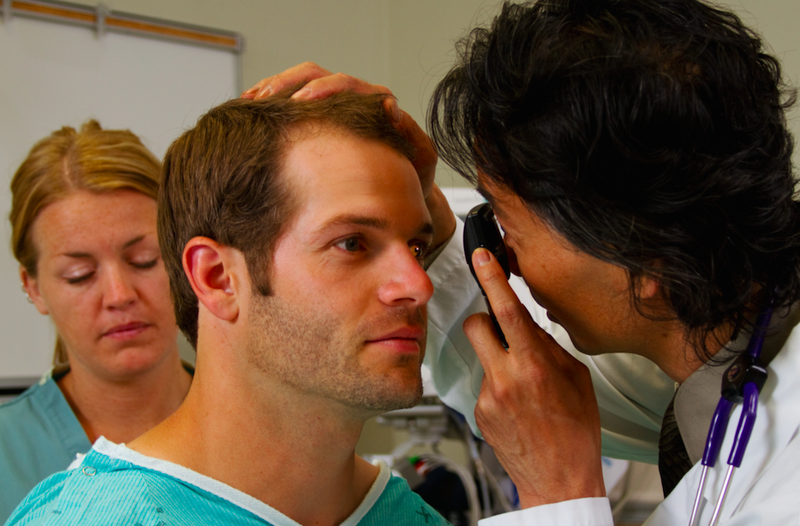 In Goldman applanation tonometry, you are given drops to numb your eye, and a pressure-sensitive tip is placed against the eye to measure its pressure. This method is the most accurate way of measuring pressure but is limited when there is an irregularity of the corneal surface. A tono-pen is a handheld instrument that is portable and can measure pressure when the device is placed against the eye. No instrument touches the eye in noncontact, or “air puff” tonometry, in which air is blown at the eye and pressure assessed by the eye’s resistance to it. Gonioscopy. In this test, a special lens containing a mirror is placed lightly on the front of your eye. It allows the health care professional to examine the angle between the cornea and the iris inside the eye. Pachymetry. This test uses a measuring device to determine the thickness of your corneas. Central corneal thickness (CCT) is an important factor in diagnosing glaucoma. Thick corneas may increase eye-pressure readings in people who do not have glaucoma. However, people with thin corneas may have normal pressure readings but still have glaucoma. A thick CCT leads to an overestimation of the pressure, while a thin CCT leads to an underestimation of the pressure. The health care professional takes central corneal thickness into consideration when assessing risk factors. Perimetry. This test, also called a visual field test, measures your side or peripheral vision. Today it is often done with computerized equipment. You place your chin on a stand in front of a computerized screen. You are asked to focus on a spot on the screen and push a button or indicate when you see a tiny flash of light. This gives your health care professional a “map” of your field of vision. Ophthalmoscopy. In this test, your health care professional places drops in your eyes to widen, or dilate, your pupils. Then the health professional looks through the pupil at the optic nerve using a special instrument (ophthalmoscope) or with special lens that magnifies details at the back of the eye. Your close vision may be blurred for several hours after this examination until the dilating drops wear off. Glaucoma treatments generally focus on reducing intraocular pressure to a level the health care professional believes will not cause further damage to the optic nerve. This level is often called the “target pressure,” and it differs from person to person and may change over the course of treatment. Eye pressure is measured in millimeters of mercury (mm Hg). It varies, even throughout a single day. Generally, eye pressure readings between 10 and 21 mm Hg are considered normal, although a person may have glaucoma even with pressures in this range. Most newly diagnosed cases of glaucoma are treated with medications, which come in topical and oral form. Topical medications may be eyedrops or eye ointments. Oral glaucoma medications come in pill and tablet form. Prostaglandin analogs. This class of drugs works near the drainage area of the eye to stimulate outflow of fluid (aqueous humor) through pathways in the eye other than through the trabecular meshwork. Latanoprost (Xalatan), travoprost (Travatan Z) and bimatoprost (Lumigan) are medications in this class used for glaucoma and hypertension of the eye. Typical dosage is one drop, once a day in the evening. Although this drug tends to be well tolerated, it has some unusual side effects. The iris may turn browner in hazel colored eyes after use over several months. Eyelid skin color also may darken.Eyelashes may become longer, thicker and darker. These changes occur only in the eye receiving the drops and may be permanent. Other possible side effects that may or may not persist include eye burning, itching, stinging, orbital atrophy, dryness of the eye and the feeling that something is in the eye.Prostaglandins may worsen other eye diseases such as iritis or uveitis. This class of medications is avoided in eyes that are at risk for a buildup of fluid in a part of the retina that allows the sight of fine details (called macular edema). Notify your health care professional if you have kidney or liver diseases, as these drugs’ side effects may increase from higher concentrations remaining in your system.Like other kinds of glaucoma eye drops, the prostaglandin analogs may make the eye more sensitive to light if the individual has uveitis or iritis (inflammation of the eye). Carbonic anhydrase inhibitors. For many years these drugs were only available in pill form but are now available as eye drops. They reduce the amount of aqueous humor the eye produces. Brinzolamide (Azopt) and dorzolamide (Trusopt) are used for glaucoma and ocular hypertension. A combination of Trusopt and Timoptic, called Cosopt, is commonly used. These are generally taken as one drop, two to three times a day. If you have severe kidney disease or liver diseases, talk to your health care professional before taking these drugs as their side effects can increase because of slower removal from your system.Common side effects that may disappear over time include: temporary blurred vision after application and a bitter, sour or unusual taste in the mouth. Less common are burning or stinging of the eye upon application, dry eye and unusual tiredness. Also possible are gastrointestinal symptoms or a runny nose. Alpha-adrenergic agonists. These drops also reduce the amount of aqueous humor the eye produces and are used to treat glaucoma and hypertension of the eye. They are chemically related to drugs used to treat high blood pressure. Apraclonidine (Iopidine) is used most often in a higher concentration before and after some kinds of glaucoma laser surgery to prevent or control a rise in eye pressure that is common after the procedure. A combination of Brimonidine and Timoptic, called Combigan, is commonly used.Brimonidine is most commonly used in this class of medication twice to three times a day. Side effects that may or may not persist with both drugs include allergic conjunctivitis, dizziness, dryness of mouth, eye discomfort and fatigue. Before taking brimonidine, tell your health care professional if you have heart or blood vessel diseases, low blood pressure, kidney or liver disease or depression. The drug can increase blood pressure and aggravate depression. Side effects of the drug may increase if you have kidney or liver disease. Additionally, brimonidine should not be taken while taking, or within two weeks of taking, certain kinds of antidepressant drugs called monoamine oxidase (MAO) inhibitors. Asthma, chronic bronchitis, emphysema or lung disease. Severe breathing difficulties, including death from bronchial tube spasms, have been reported. The possibility of wheezing also exists. Diabetes or low blood sugar. Antiglaucoma beta blockers may change blood sugar levels and may mask some signs and symptoms of these conditions, such as fast heart beat and trembling. Heart or blood vessel disease. Beta blockers for glaucoma may reduce the pulse rate and decrease heart activity. Overactive thyroid. Signs and symptoms of hyperthyroidism can be masked by beta blockers for glaucoma. Additionally, suddenly stopping the drugs can cause a dangerous increase in overactive thyroid symptoms. History of severe allergic reactions. Beta blockers for glaucoma may reduce the effectiveness of medicines used to treat severe allergies. Before having any kind of surgery, dental procedures or emergency treatment, tell your attending health care professional that you are taking beta blockers for glaucoma because side effects of the drug may be increased. Common side effects include decreased night vision and stinging of the eye upon application of the medication. Temporary blurred vision may occur, usually lasting from 30 seconds to five minutes. Less common side effects that may eventually disappear are acid or sour stomach, belching, achy eyebrows, constipation, crusting of eyelashes, eye dryness, dry skin, indigestion, eye irritation, pain, redness and warmth or swelling of muscles. Oral medications. The oral medications for glaucoma are carbonic anhydrase inhibitors aimed at slowing production of aqueous humor in the eye. These include acetazolamide (Diamox), dichlorphenamide (Daranide) and methazolamide (Neptazane). Dosages of these pills vary. Side effects tend to be more common in the pill forms of these drugs than the eyedrop form. They can include drowsiness, dizziness, lightheadedness and fatigue. They also can cause loss of potassium. Your health care professional may recommend that you eat foods high in potassium, such as oranges or citrus fruit juices, or take a potassium supplement. However, you should not change your diet on your own, as the extra potassium may not be necessary and can be harmful.In people with diabetes, oral carbonic anhydrase inhibitors may raise blood and urine sugar levels. They also may produce shortness of breath and breathing problems if you have emphysema or lung disease. They also may worsen kidney disease, kidney stones and liver diseases. If you have any of these conditions, make sure you discuss them with your health care professional before taking the drug. Your health care professional may recommend that you drink more fluids while taking these medications to prevent development of kidney stones. Don’t increase your fluid intake on your own without consulting your health care professional.Other side effects that may stop over time include an increase in the frequency of urination; tingling or burning sensations in fingers and toes; diarrhea; a general feeling of illness; loss of appetite; metallic taste in the mouth; and nausea or vomiting. Your health care professional may recommend taking the medication with meals to lessen the chance of stomach upset. Miotics. These drugs increase the rate at which the aqueous humor flows out of the eye. Pilocarpine is the oldest miotic used to treat glaucoma. It comes in drop and ointment form. Dosage for the drops is typically one drop, four times a day. It is not used as often since the newer medications have fewer side effects.Pilocarpine usually contracts the pupil, which lets less light into the eye, resulting in darkened or dim vision and reduced night vision. Blurred vision also may occur for several hours after taking the drug. Eye irritation and headache may occur, but these are less common side effects and may disappear over time.Carbachol is another miotic that is prescribed in drop form. It helps to open the eye’s drain and increase the rate of fluid flowing out of the eye. It is rarely used, but effective.The most important thing to remember when taking glaucoma medications is to take them as directed by your health care professional. For the drugs to work effectively, they must be taken regularly and without interruption. If you have multiple drops, remember to wait a minimum of five minutes between drops or close your eyes for three minutes. You will need to take them as long as they control your eye pressure. If you forget to take your medication, restart them right away. If medications fail to lower your eye pressure, your health care professional may recommend surgery, either by laser or by conventional operative techniques. Sometimes surgery is recommended as the first-line treatment. Laser surgery uses a concentrated beam of light to open clogged drainage canals. Most laser surgeries can be done on an outpatient basis. First the eye is numbed with drops that last throughout the procedure. Then a health care professional holds a special lens to the eye, and the laser beam is aimed at the lens and reflected onto its target. The person sees a bright light, similar to a camera flash, and usually feels little or no discomfort. After treatment, the eye may be irritated and vision may be blurred. Drops for soreness may be prescribed. Normal activities usually can be resumed after the procedure. Follow-up visits with your health care professional will be required to monitor intraocular pressure. Trabeculoplasty. For people with open-angle glaucoma, a laser is used to open the trabecular meshwork drainage area in the eye, which allows the aqueous humor fluid to move more freely and reduces intraocular pressure. In this procedure, the laser makes tiny burns in the meshwork, which stretches and opens the drainage holes. Intraocular pressure is checked after the procedure, and usually drops are given to be used at home for soreness or swelling inside the eye. In some cases, only half of the meshwork may be treated in one surgery. The remainder is treated in a later laser surgical session. If you have glaucoma in both eyes, only one eye will be treated at a time. The multisession approach allows the physician to decide if additional sessions are needed to reach the target pressure.Research shows that laser trabeculoplasty is very good at lowering intraocular pressure in some people. However, its effects can wear off over time. Your doctor may suggest further treatment. Another form of trabeculoplasty, called selective laser trabeculoplasty, has been introduced. It treats specific pigmented cells “selectively” and leaves the untreated portions of the trabecular meshwork intact. For this reason, SLT may be repeated several times and may also be an option for people with glaucoma who have not had success with traditional laser surgery or pressure-lowering drops. Iridotomy. For people with angle-closure glaucoma, this surgery uses the laser beam to make a tiny hole in the iris to improve the flow of the aqueous humor to the drainage meshwork. Another approach to filtering surgery is the use of drainage devices such as Ahmed glaucoma shunt, Krupin valve, Molteno implant and Baerveldt implant. Their use has increased in recent years. Vision loss from glaucoma can be prevented if the disease is detected and treated in time. Because glaucoma rarely produces symptoms until it has progressed, regular eye examinations are the key to early detection and treatment. For those with no risk factors, the American Academy of Ophthalmology recommends a complete eye exam once in your 20s and twice in your 30s. You should have a baseline comprehensive eye exam at age 40, and your eye doctor will recommend follow-up exams based on your family history and the results of the baseline exam. After age 65, it’s important to have a complete eye exam every year or two. You’re at risk of developing glaucoma if you are older than age 60; are African American, an older Latino, especially of Mexican descent; have a family member who has glaucoma; are very nearsighted; are diabetic; have had an eye injury in the past; or have been taking steroid or cortisone medications regularly. In such cases, you should have an eye exam including tests for glaucoma every one to two years after age 35. If you are African American, your risk of developing the open-angle type of glaucoma is higher than for Caucasian people, according to the National Eye Institute. Open-angle glaucoma accounts for 19 percent of all blindness among African-Americans, compared to only 6 percent in Caucasians. Older Hispanics/Latinos are also at elevated risk, with the highest prevalence for glaucoma being among those of Mexican descent. Individuals who are far-sighted (hyperopic), with narrow angles and of Asian descent are at risk for acute or chronic angle glaucoma. Although there is no known way to prevent glaucoma, maintaining a healthy lifestyle may help you generally avoid diseases. Eating a balanced diet is the best way to ensure your body receives the proper nutrients it needs to function. Some of the vitamins and minerals that contribute to overall eye health include antioxidant vitamins A, C and E, and minerals zinc, copper and selenium. If you’re concerned about your diet, talk with your health care professional about whether you should take nutritional supplements or make dietary changes. Getting regular exercise also is a component of maintaining good overall health, and there is some evidence in the medical literature that regular aerobic exercise may help reduce eye pressure. In fact, some studies indicate that exercise that raises the pulse rate by just 20 percent to 25 percent (for example, a brisk walk) for 20 minutes, at least four times a week, can help reduce intraocular pressure, according to the Glaucoma Foundation. Before starting any exercise program, make sure you discuss possible effects on your intraocular pressure with your health care professional. Some forms of glaucoma, such as angle-closure, are unresponsive to exercise or run the risk of increasing eye pressure. Additionally, exercises or yoga movements that hold the head upside down have the potential for increasing eye pressure and generally are discouraged for everyone with glaucoma. If you are diagnosed with glaucoma, it doesn’t mean you will become blind. To control your disease and protect the sight you have, adhere to the prescription drug regimen recommended by your health care professional and have regular eye examinations to monitor the disease. Glaucoma is a group of eye diseases that, when left untreated, damage the optic nerve and can lead to blindness. Often called the “sneak thief of sight,” glaucoma usually produces no early warning signs and no symptoms until it has progressed to the point of stealing sight. More than 2.2 million Americans have glaucoma, but half don’t know it, according to the National Eye Institute. The risk of blindness from glaucoma is four times greater in African Americans than in Caucasians overall, and 14 to 17 times greater in African Americans age 45 to 65 than in Caucasians of the same age, according to Prevent Blindness America. You are at risk for developing glaucoma if you are African American, are over age 60, have family members with glaucoma, are diabetic or are very nearsighted. Glaucoma can occur in children as well as adults. About one out of every 10,000 babies in the United States is born with glaucoma. Glaucoma has no cure, but it can be controlled. Treatment may include medications and surgery. Although treatment for glaucoma focuses on reducing pressure in the eye, it is possible to have higher than normal eye pressure and not have glaucoma. There is no way to prevent glaucoma, but getting regular, comprehensive eye examinations is the best way to identify disease before it affects vision. Does glaucoma always lead to blindness?No. Although glaucoma is a leading cause of blindness in the United States, it can be controlled and vision maintained if it is detected early. Because the disease usually produces no symptoms until it has begun to damage a person’s sight, many of those who have it don’t know it. That’s why comprehensive eye examinations are recommended at least every two years starting at age 35 for those at increased risk for the disease. What are the risk factors for glaucoma?You are at risk of developing glaucoma if you are older than age 60, African American, Latino (especially of Mexican descent), have a family member who has glaucoma, are very nearsighted, are diabetic, have had an eye injury in the past or have been taking steroid or cortisone medications for a length of time. In such cases, you should have an eye exam including tests for glaucoma every one to two years after age 35. If you are African American, your risk is especially great. The National Eye Institute reports that African Americans are six to eight times more likely than Caucasians to develop glaucoma. What’s the difference between high eye pressure and glaucoma?Glaucoma is a group of eye diseases that damages the nerves carrying images from the eye to the brain. When the fluid inside the eye that nourishes the cornea and the lens can’t flow properly through the eye, pressure in the eye builds. The pressure compresses the optic nerve and can damage it. Whether you develop glaucoma depends on how much pressure your optic nerve can take without being damaged. My eye pressure is 22 mm Hg. Does that mean I have glaucoma?Not necessarily. Eye pressure is measured in millimeters of mercury (mm Hg), and it varies, even throughout the day. Generally, eye pressure readings between 10 and 20 mm Hg are considered normal, although a person may have glaucoma even with pressures in this range. It’s a common misconception that having high intraocular pressure means you have glaucoma. In fact, you can have high intraocular pressure, known as ocular hypertension, and not have glaucoma. In some people, the optic nerve can tolerate pressures higher than the range considered normal. The only way to determine whether you have glaucoma is to have a comprehensive eye examination. What is the most common type of glaucoma?Open-angle glaucoma is the most common form of the disease. In open-angle glaucoma, the angle where the cornea and the iris meet in the eye is open, but the aqueous humor fluid passes too slowly through the meshwork drain. As a result, the pressure in the eye gradually increases, compressing cells in the optic nerve. If left untreated, the compression eventually will cause the optic nerve cells to die, producing blindness. What is the most common treatment for glaucoma?Glaucoma is most commonly treated with prescription medications in the form of eyedrops. Many of the prescriptions must be taken once to several times a day. Glaucoma medications, which can come in topical or oral form, are designed to lower pressure in the eye. Other glaucoma medications come in the form of a gel. Most topical medications reduce eye pressure by either increasing the flow of the aqueous humor fluid out of the eye or reducing the amount of the fluid produced in the eye. Oral glaucoma medications come in pill and tablet form and are aimed at slowing production of fluid in the eye. Can surgery help my open-angle glaucoma?Possibly. If medications fail to lower your eye pressure, your health care professional may recommend surgery, either by laser or by conventional operative techniques. Sometimes surgery is recommended as the first-line treatment. In a procedure called laser trabeculoplasty, a beam of concentrated light is used to open the drainage area in the eye. This allows the fluid in the eye to move more freely and reduces intraocular pressure. The effects of laser treatment may wear off over time. Once the entire drainage area has been treated with the laser, further treatments may be ineffective. Conventional surgery for glaucoma, also called filtering microsurgery, creates a new opening for the intraocular fluid to leave the eye. It often is recommended after medications and/or laser surgery have failed to control intraocular pressure. The surgery involves removing a small piece of the white, outer shell of the eye to create a channel through which the aqueous humor fluid can flow. This incisional surgery has been between 60 percent and 80 percent effective in lowering pressure. What can I do to prevent glaucoma?There is no known way to prevent glaucoma. However, vision loss from glaucoma can be prevented if the disease is detected and treated in time. Because glaucoma rarely produces symptoms until it has progressed, regular eye examinations are the key to early detection and treatment. For those with no risk factors, the American Academy of Ophthalmology recommends a complete eye exam once in your 20s and twice in your 30s. You should have a baseline comprehensive eye exam at age 40, and your eye doctor will recommend follow-up exams based on your family history and the results of the baseline exam. After age 65, it’s important to have a complete eye exam every year or two. I’ve heard people with glaucoma should take special vitamin supplements. What should I be taking and in what dose?Although glaucoma can’t be prevented, maintaining a healthy lifestyle and eating nutritious foods may help you generally avoid diseases. Eating a balanced diet is the best way to ensure your body receives the proper nutrients it needs to function. Some of the vitamins and minerals that may contribute to overall eye health include antioxidant vitamins A, C and E, and minerals zinc, copper and selenium. If you’re concerned about your diet, talk with your health care professional about whether you should take nutritional supplements or make dietary changes. Can exercise help my glaucoma?Getting regular exercise also is a component of maintaining good overall health, and there is some evidence in the medical literature that regular aerobic exercise may help reduce eye pressure. Before starting any exercise program, make sure you discuss possible effects on your intraocular pressure with your health care professional. Some forms of glaucoma, such as angle-closure, are unresponsive to exercise or run the risk of increasing eye pressure. Exercise can increase the pressure in pigmentary glaucoma. Additionally, exercises or yoga movements that hold the head upside down have the potential for increasing eye pressure and generally are discouraged for everyone with glaucoma. Talk with your health care professional about what kind of exercise is best for you. Is there any special way I should take my glaucoma eye drops?The most important thing to remember when taking glaucoma medications is to take them exactly as directed by your health care professional. Make sure you understand how and when to take your medications and how to properly store them. For the drugs to work effectively, they must be taken regularly and without interruption. You will need to take them as long as they control your eye pressure.